Looking for fun things to do in Chicago? Look no further - Explore Chicago with one of our professional guides on this scenic 7 or 8 mile Chicago Segway tour. Begin these guided Chicago Segway tours traveling through the fragrant garden paths of Grant Park to view Buckingham Fountain. Enjoy the breeze as you glide effortlessly to the most popular Chicago tourist attractions along the Chicago lakefront: the Museum Campus, the Shedd Aquarium, the Field Museum, and of course Soldier Field, home of the Chicago Bears. You can't go wrong with this perfect sightseeing tour. There is nothing like seeing the city on a Chicago Segway tour. With our exceptional guides, you will get an amazing overview of the Windy City's sights and sounds. You get up close to all of the attractions and cover a whopping 7/8 miles round trip. Segways are intuitive and easy to ride; if you can stand you can ride! You only glide with a maximum of 8 people per tour guide, so you are guaranteed to have personalized and fun adventure in the Second City that is second to none. Guests are asked to arrive 15 minutes prior to the tour's scheduled departure time to check in and fill out waivers. All guests will be fitted with helmets. The tour begins at the departure time with a training video and comprehensive one-on-one training with the tour guide. Training ensures that even the most nervous guest feels comfortable for the duration of the tour. Once training is complete, your friendly and knowledgeable tour guide will lead you through the park to see some of the most amazing sights Chicago has to offer. You will stop by Buckingham Fountain, Chicago's lakefront, the Field Museum, the Shedd Aquarium, and Soldier Field. 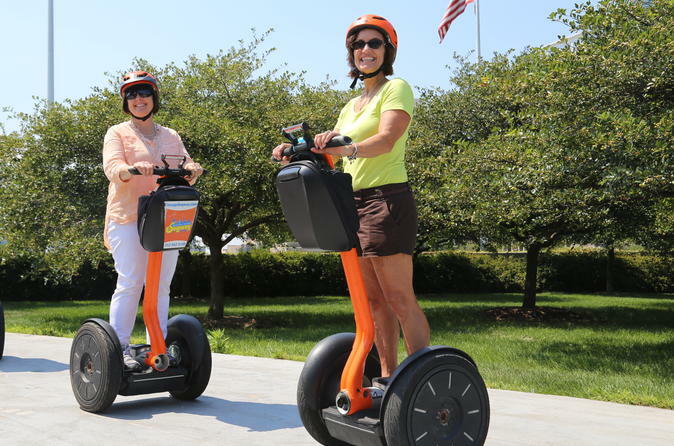 Your tour guide will share insights and fun facts as you glide on this fun Chicago Segway ride. There will be plenty of opportunities for photos with the picturesque skyline as your back drop. Special Offer - Book by October 14, 2018 to save 20% off our previously offered price! This special offer is available on the 2.5-hour tour options only. - Book Now!